The 2011 Edwin G. Conklin Medal was awarded to Ruth Lehmann for her distinguished and sustained research in developmental biology, particularly in the field of germ cell development. The former SDB president is director of the Skirball Institute for Biomedical Research and the Helen L. and Martin S. Kimmel Center for Stem Cell Biology at New York University. Lehmann, a Howard Hughes Medical Institute Investigator, has made seminal contributions to our understanding of mechanisms of embryonic development. As a graduate student in Christiane Nüsslein-Volhard’s lab at the Max Planck Institute in Tübingen, Germany, Lehmann studied maternal effect genes in Drosophila. She identified genes required for proper patterning of posterior segments in the embryo and specification of germ cells, which develop at the posterior pole. As an independent researcher at the Whitehead Institute in Cambridge, Massachusetts, her continued work on these genes led to the great discovery that localization of nanos and oskar RNAs at the posterior pole was what controlled their translation into protein and thus proper posterior patterning and germ cell formation. In addition, it was the 3’UTRs of these genes that were responsible for their RNA localization. Throughout her career Lehmann has worked on various aspects of germ cell development from their specification to their migration and maintenance. It was the Drosophila mutants themselves that led her in unexpected directions to explore the roles of RNA regulation, DNA repair, reductive oxygen species signaling, lipid signaling, and the HMG-CoA reductase pathway in germ cell development. In an interview in April, Lehmann shared the two things that have been most rewarding throughout her career: making discoveries and training scientists. One becomes a scientist to make discoveries, she said. “...[S]everal times we just stuck to doing something and then it really panned out and I think that’s very rewarding...” It is also rewarding to see students and postdocs “do well in my lab and then they go on and they have very productive careers,” she said. Much like development depends on molecules being in the right place at the right time; Lehmann’s career trajectory was in her mind a result of being in the right place at the right time. In 1977, Lehmann left Germany as a “disgruntled undergraduate” who was “bored with biology,” to study ecology in the United States at the University of Washington on a Fulbright Scholarship. She quickly realized that was not for her—as she preferred genetics and mathematics. Through discussions with other students, Lehmann connected with Gerold Schubiger, a fly developmental biologist, who would become her first scientific mentor. At the end of that year, Lehmann didn’t know where she should go next, so Schubiger suggested she attend a conference. The 1978 Society for Developmental Biology meeting in Madison, Wisconsin was Lehmann’s first scientific conference. It was at that meeting where she met her future PhD mentor, Christiane Nüsslein-Volhard. Unfortunately, Nüsslein-Volhard was moving to an independent position at the European Molecular Biology Laboratory in Heidelberg which was not associated with a graduate program. She suggested Lehmann go to the University of Freiburg to study with José Campos-Ortega. Campos-Ortega, who studied the development of the nervous system in Drosophila, was Lehmann’s second mentor. He taught her electron microscopy and got her “thinking about cells.” During this time, Lehmann kept in contact with Nüsslein-Volhard and upon completing her Diploma thesis, she joined Nüsslein-Volhard at the Max Planck Institute to do her doctorate. Nüsslein-Volhard not only taught Lehmann genetics and embryology, but through her example taught her how to run a lab and mentor scientists. Lehmann attributes her opportunity to do great science alongside Christiane Nüsslein-Volhard which catapulted her career, to the year she spent with Gerold Schubiger in Seattle. Academically, that year did not count toward anything, but it was a “completely career changing time,” she said. 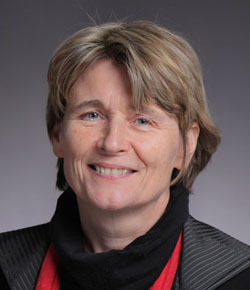 Following her graduate work in Tübingen, Lehmann did a short postdoc with Michael Wilcox at the Medical Research Council Laboratory of Molecular Biology in Cambridge, England where she learned molecular biology from “many amazing colleagues.” In 1988, Lehmann joined the faculty of the Massachusetts Institute of Technology’s Department of Biology and became a member of the Whitehead Institute. In 1996, she moved to the Skirball Institute at NYU where today she is Director. In her role as Director of the Skirball Institute she has hired nine new junior faculty in the last five years. She asks herself, “How do [I] establish an interesting science environment beyond my lab?” This has been very rewarding for her. She does not allow the less enjoyable aspects of being an administrator get to her.